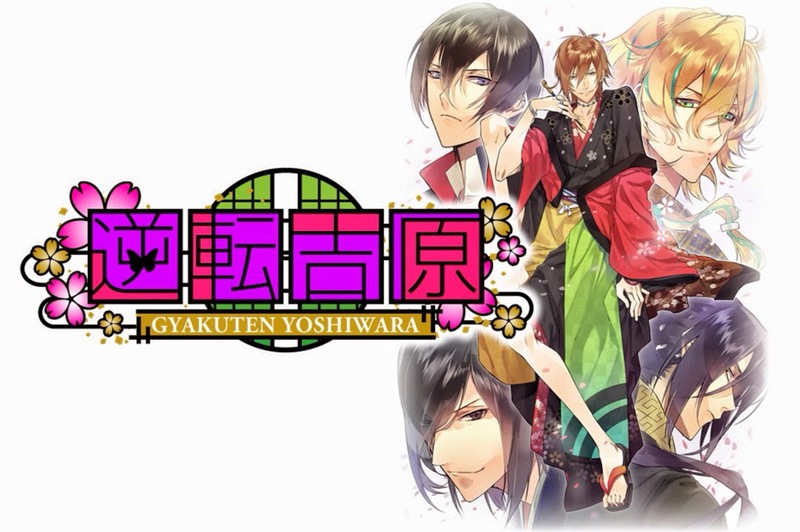 I was very surprised to learn that veteran Japanese game company D3 Publisher had recently released an official English (and Chinese) edition for their smartphone visual novel Gyakuten Yoshiwara. The unusual setting caught my eye and it wasn't long before I was downloading the free trial to see what it was like. The plot of Gyakuten Yoshiwara (since retitled Forbidden Romance: The Men of Yoshiwara) is straightforward; you're a young woman living on an island where there's a huge gender imbalance. 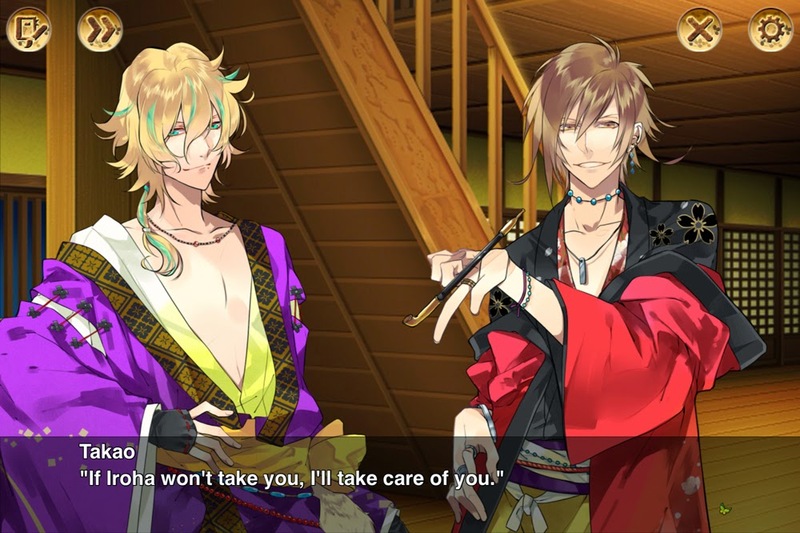 The men are so rare that the majority of them live and work in the Yoshiwara pleasure district, selling their nights to lonely girls who are looking for male company or yearning for a child. It's a simple reversal of the many stories of forbidden love between a man and his favourite courtesan which have been staples of the historical fiction genre for years. The Yoshiwara district of the game has its own distinct culture which blends the Edo period red light district with the more masculine atmosphere of a modern host club. Everyone there wears gorgeous costumes loosely inspired by historical attire. Although the theme of the game is rather adult in nature, the game's content doesn't contain anything naughtier than you'd find in an everyday drama or soap opera. The dialogue very generously refers to the men as 'gentlemen of the night' rather than anything vulgar. Since the game had only just been released when I checked it out, there were only two characters available for selection. I chose the gaudily-dressed Takao as my young lady's first partner because his flashiness was appealing. If the manager of a brothel was offering my character a night with a courtesan of her choice, why not go all the way and choose their top oiran? I dutifully paid the fee to play the main storyline once the free introduction was over and ended up paying for two bonus chapters afterwards, so I guess that shows I enjoyed it. The character artwork is lovely and bursting with the flamboyant colours of the pleasure district. There are only five characters in total though there are six routes - one guy has a second storyline which hasn't yet been released. Despite the small selection I think most gamers will be able to find a partner they're reasonably happy with, whether it's the audacious Takao, highly-strung Tokiwa, elegant Kaguya, inexperienced Kagerou or the ruthlessly efficient manager, Iroha. It doesn't hurt that they're all exceptionally handsome. One of the unusual features of Gyakuten Yoshiwara is that it employs the 'E-mote' system, which means that the character artwork will gently move as you play to make it seem more 'alive'. It's a little like the motion in games such as Dragon's Crown except when I first played the characters' facial features would sometimes twitch weirdly along with their swaying hair. The first thing I did after encountering this phenomenon was look for a way to disable the system; sadly, this wasn't possible. Some character artwork tolerated the distortion better than others; watching Takao's eyes and nose wildly contorting made me feel more disturbed than impressed. The effect looks pretty good on the rest of the characters and you can see it in action in this promotional video. Thankfully, the glitchy animation was fixed shortly after the game's release with a free update. It's a shame this wasn't until after I had played through Takao's entire story as I'd got into the habit of dreading his attempts to kiss the main character! The new animations are a big improvement and much closer to the original designs. While it's not unusual for a smartphone title, perhaps the biggest potential disappointment of the game is the lack of voice acting. There's none at all, which means you're entirely dependent on the translated English script for immersion. I'm so used to seeing and hearing the original speech patterns in this kind of game that it feels as though something's missing. Instead of voices the player is treated to a selection of delightful instrumental music to set the scene. Over in Japan there are three situation CDs voiced by what seems to be a fantastic seiyuu cast (along with a spin-off manga) so perhaps a fully-voiced sequel might be possible one day if the series becomes more popular? Where the lack of voicing hurts most is that the mostly-serviceable English translation is riddled with typos; in some cases these are quite severe, such as the two occasions during Takao's route where the wrong character's name was attributed to an important line of dialogue. The characters' names were mixed up again in Iroha's route, so I felt that the translator might have been working from a script without being able to see who was speaking on-screen. Another reason for my suspicion was that the tone of the dialogue didn't always match what was happening (no doubt exacerbated by the vagueness of written Japanese). If D3 Publisher could try to have a second native English speaker proofread their scripts in future to check for mistakes it could greatly improve the quality of their adaptations. Despite a few teething problems, Gyakuten Yoshiwara is a fascinating experiment and for its low price it's a no-brainer if you like sultry guys and historical settings. There are two endings for each story and attractive CG illustrations to collect. It's absolutely wonderful to see more quirky visual novels getting official English-language releases. Fans with access to an iOS device should definitely check it out to help support this niche genre in the west. The English edition of Gyakuten Yoshiwara can be downloaded for free from iTunes in the UK, USA, Japan and in many other local stores. The introduction and first chapter of each character's story is free; after that you have to pay to find out what happens - in the UK it costs £2.49 per story, with a extra stories available for 69p each if you can't get enough of these 'gentlemen of the night'. The price seems very reasonable, especially as you can pick and choose your favourite guys in any order. Since the game's initial release the updates have been thick and fast and most of the main characters now have their stories available for purchase. 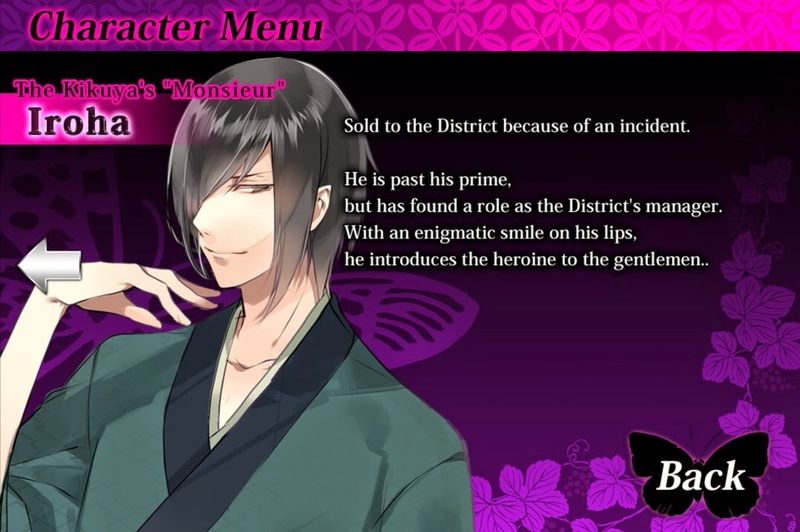 Since I like his exotic looks, flawless dress-sense and surly personality, I'm going to buy Tokiwa's story next as soon as it's released - and then I'm going to think about ordering the situation CDs for more immersion! 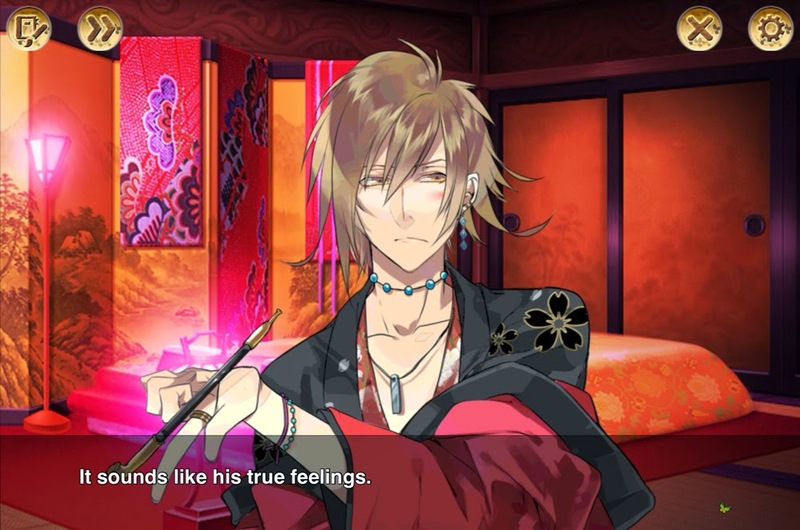 Update 13th July 2014: The game has recently been retitled Forbidden Romance: The Men of Yoshiwara so I've updated the review to reflect this! Edit: Wow! Thank you! I never expected to be able to unlock the pictures but I've already received the maximum number of points from people using the code! Please enjoy the game, everyone.